Legends Bar & Grill is the place to après ski after your day on the slopes. Come in and enjoy our legendary grilled chicken nachos, warm spinach and artichoke dip and a tasty beverage while you recount the days adventures. If you’re looking for a sit down lunch or dinner, Legends offers a great full service menu. 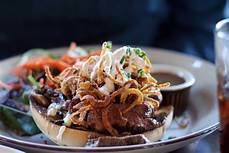 Our 8oz Kobe beef Legends burger is a must have, or if you’re craving something on the lighter side try our homemade French onion soup or Ahi tuna salad. Located on the ground floor of Legacy Lodge in the resort base area. Legends offers a casual, yet elegant atmosphere, with flat screen TVs and a large bar where you are guaranteed to make some new friends. Local menu favorites include the Legends Burger, the bacon-wrapped Meatloaf, and the enormous Nachos that are perfect for sharing. With local beers on tap and a full bar, Legends is also the perfect place to grab a drink after a long day on the mountain.